Ribblesdale Wanderers skipper Jordan Britcliffe is expecting to ruffle a few feathers this season as the club targets promotion to the top flight. Having missed out on promotion by the skin of their teeth on a couple of occasions now, the 27-year-old firmly believes that this is their year. Wanderers have brought in Scottish paid man Michael English, who featured for the club at the end of the 2017 term. Ryan Canning has also returned to Church Meadow, while the capture of Andrew Needham on a British passport has opened the door for the club to sign Shaan Singh-Parhar from New Zealand as an overseas amateur. Kian Farnworth has left for Rishton, Bilal Ahmed has rejoined Clitheroe and Sam Jackson has linked up with his siblings at Whalley. Britcliffe said: “Despite the loss of the three amateurs the side looks and feels a lot stronger on paper. “We fully expect to score some runs, which has been our downfall in the past as we’ve always had a pretty good defence with the ball. “I am honoured and very excited to be given the opportunity to captain my club for a second season and can’t wait to get to work with our very young but talented side. “I can seriously see us ruffling some feathers this year. Our aim has to be to win our division and finally get out of it after coming so close in the last few years. Meanwhile, Salesbury begin life back in Section A of the Ribblesdale League with a derby at Read on Saturday. 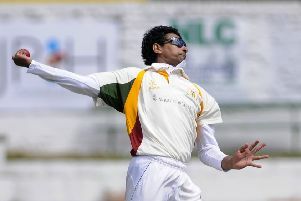 Hashen Ramanayake will return after a hugely-successful 2018, in which he scored over 1,018 runs in all competitions, took 58 wickets and claimed 28 catches. The Red Caps won Section B last season, and, indeed, finished top of the overall league table in terms of points gained. Whalley open at home to Cherry Tree, with a new professional in Jack Edgar, who replaces Sam Sweeney. Edgar featured for Great Harwood, either side of a stint with Lowerhouse in the Lancashire League, and has also played for Bradford and Bingley in the Bradford Premier League, as an opening batsman.